Background There has been a growing interest in the topical use of tranexamic acid (TXA) for the prevention of bleeding during different surgeries. Patients with liver cirrhosis may develop upper gastrointestinal (UGI) bleeding, which arises because of portal hypertension, which includes gastroesophageal varices and portal hypertensive gastropathy. The aim of this study was to evaluate the efficacy of the local application of TXA in reducing blood loss, transfusion requirements, and shortening the time for emergency endoscopy in cirrhotic patients presenting with UGI bleeding. Patients and methods A total of 100 patients with end-stage chronic liver disease presenting with UGI bleeding were randomly assigned to two groups to receive a standard protocol for UGI bleeding management, in addition to nasogastric lavage with either normal saline only (group S) or normal saline with TXA (group S+TXA). The lavage was repeated till its measured hematocrit (Hct) was less than 1%. The duration to reach this Hct was recorded. The volume of washes and transfusion requirements for each group were also recorded. 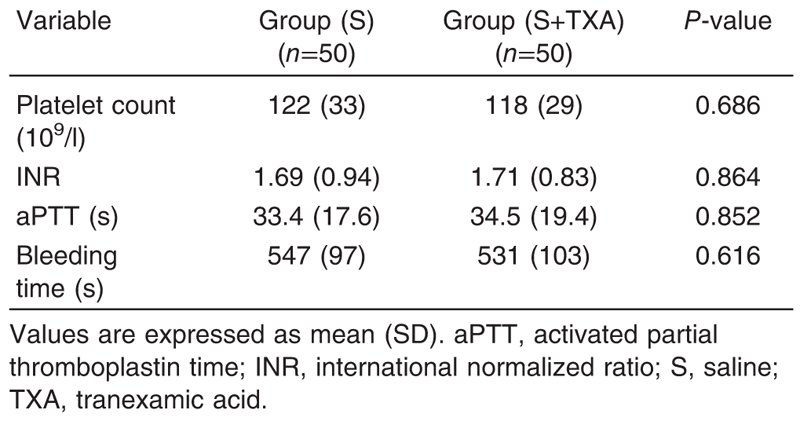 Results Hemodynamic stability was observed in group S+TXA with less bleeding. The volumes of washes were significantly lower in group S+TXA. Time to reach Hct less than 1% in washed fluid was significantly shorter in group S+TXA (81.5±20.7 min) compared with group S (230.1±29.9 min). 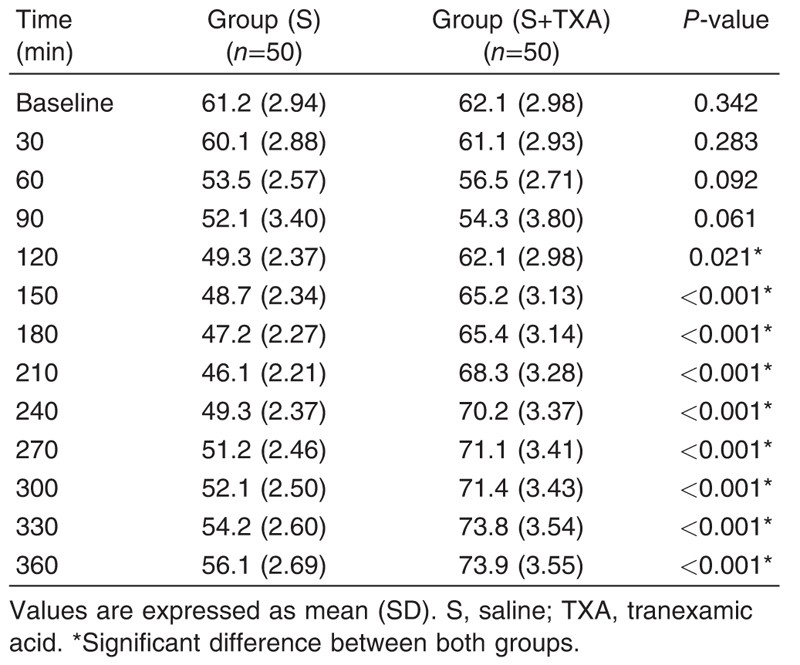 Transfusion requirements were significantly low in group S+TXA (765±184 ml) compared with group S (1345±278 ml). Duration to perform emergency upper endoscopy was shorter in group S+TXA (667±198 min) compared with group S (1094±163 min). Conclusion Local application of TXA during nasogastric lavage was efficient in reducing blood loss and transfusion requirements and in shortening the time for emergency endoscopy in cirrhotic patients presenting with UGI bleeding. Gastrointestinal bleeding related to portal hypertension is a serious complication in patients with liver cirrhosis. Most patients bleed from esophageal or gastric varices, but bleeding from portal hypertensive gastropathy is also possible . The control of gastrointestinal bleeding is more difficult to achieve in liver cirrhosis patients than in patients with normal hepatic function. The impaired hemostasis plays an important role in the difficulties in stopping gastrointestinal bleeding. Patients with end-stage liver disease have complex alterations that involve all the components of hemostasis. Thrombocytopenia and multiple coagulation factors are low in plasma in a rough proportion to the degree of compromised protein synthetic capacity of the liver . Hyperfibrinolysis in liver cirrhosis is due to the increase in tissue plasminogen activator in plasma and decrease in the naturally occurring inhibitors of plasmin . There is no specific treatment available that can efficiently correct impaired hemostasis . The management of acute bleeding has changed over the last few years. Patients are managed with a combination of endoscopic and pharmacologic treatments . Hemostatic drugs have shown an uncertain role in the prevention and treatment of bleeding in clinical settings associated with end-stage liver disease . Among antifibrinolytic drugs, a potential candidate is tranexamic acid (TXA), which, when given intravenously, inhibits fibrinolysis through competitively blocking the lysine-binding sites of plasminogen . It has been locally used successfully to reduce the blood loss and transfusion requirements in many surgeries such as cardiac surgery , liver surgery , gynecology , and orthopedic surgery . Emergency esophagogastroduodenoscopy carried out for upper gastrointestinal (UGI) bleeding may be more difficult as compared with elective endoscopy due to the problem of blood in the lumen interfering with adequate visualization of mucosal surfaces. Incomplete visualization may lead to failure in making an accurate diagnosis of the etiology of bleeding or may lead to difficulty in performing endoscopic therapy . The aim of this study was to assess the efficacy of the local application of TXA in reducing blood loss and transfusion requirements, and in shortening the time for emergency endoscopy in cirrhotic patients presenting with UGI bleeding. This prospective, randomized, controlled, double-blinded study was conducted in Ain Shams University Hospitals from 2014 to 2015. One hundred patients having chronic liver disease with cirrhosis, aged between 40 and 75, who were admitted to the ICU with UGI bleeding and were scheduled for endoscopy within 24 h were included in the study. The study was approved by the Research Ethical Committee at Ain Shams University. A written informed consent was obtained from the patients’ relatives as this was an emergency situation, as there was a chance of the patients developing encephalopathy. All patients belonged to class A or B of the Child–Pugh classification of liver disease , with a score not exceeding 8/15; in addition, they had a modified Glasgow-Blatchford score  of greater than 6 and an international normalized ratio (INR) not exceeding 1.5. Exclusion criteria included Child–Pugh class C or score more than 8/15, INR more than 1.5, tense or refractory ascites, serum sodium less than or equal to 120 mEq/l, grades III or IV hepatic encephalopathy, and spontaneous bacterial peritonitis. Patients with a BMI of more than or equal to 40 kg/m2, known allergy to any of the medicines used, renal or cardiovascular dysfunction, bronchial asthma, and hematological disorders (other than secondary to chronic liver disease) were also excluded from the study. The patients were admitted to the ICU and placed on standard monitors; heart rate (HR), noninvasive mean arterial blood pressure (MAP), and oxygen saturation were documented at 5 min intervals. A nasal prong was applied and supplemental oxygen at 4 l/min was given throughout the patient’s stay in the hospital. Blood samples were collected for measurement of baseline platelet count, INR, activated partial thromboplastin time, and bleeding time. All patients received a standard protocol for UGI bleeding management . Continual assessment and appropriate management of airway, breathing, and circulation. Initial resuscitation with crystalloids and blood products. Proton pump inhibitor infusion therapy − omeprazole 80 mg intravenous bolus followed by an infusion of 8 mg/h. Octreotide (somatostatin analog) 100 μg intravenous bolus, followed by continuous infusion of 50 μg/h. Broad spectrum antibiotic (ceftriaxone) − 1 g/day prophylaxis against spontaneous bacterial peritonitis. Insertion of a nasogastric tube for lavage and drainage of UGI bleeding. A total of 100 patients were randomly assigned to two groups (each group=50 patients). An online randomization program (https://www.randomizer.org) was used to generate a random list and to allocate patients into the two study groups. Random allocation numbers were concealed in opaque closed envelopes. Before enrollment, all intensive care physicians and nurses were unaware of the group to which the patients would be randomized. Each group received a standard protocol for UGI bleeding management. Nasogastric lavage was carried out with either normal saline only (group S) or TXA 1 g added to each 500 ml normal saline (group S+TXA). TXA 1 g added to each 500 ml normal saline was prepared by a physician who did not participate in patients’ caregiving. The technique for nasogastric lavage was as follows. Nasogastric lavage was carried out with 250 ml of the prepared solution. Each lavage was kept for 10 min before draining the effluent for another 10 min, so that each wash took 20 min and was recorded. A sample from each effluent was taken to measure its hematocrit (Hct) level. The lavages were repeated till its measured Hct was less than 1%, which was considered as the primary end point of the study. The duration to reach this Hct was recorded. Volume and number of required lavages were recorded. Transfusion requirements for each group were also recorded. Hemodynamics including HR, MAP, and peripheral oxygen saturation were recorded on admission (baseline) and every 30 min. Baseline serum hemoglobin concentration and Hct were measured. Packed red blood cells (RBCs) were transfused for patients with hemoglobin greater than 8 g/dl; the number of packed RBCs units required for each patient was also recorded. Patients underwent UGI endoscopy after the effluent became clear (Hct in wash <1%). Duration of the emergency upper endoscopy was defined as the time from the first nasogastric lavage to the time it took to perform emergency upper endoscopy. Endoscopy was done after preparation of the patients, which included packed RBCs transfusion. Complications related to the use of TXA (deep venous thrombosis, pulmonary embolism, stroke, myocardial infarction, and mortality) and gastric lavage (aspiration) were recorded. A sample size of 90 patients (45 in each study group) was calculated to detect a 50% reduction in the time needed for the effluent to be clear (Hct<1%) with a power of 80% and an α-error of 5%, and with two-sided testing and previous unpublished experience showing normally distributed data and a SD of 20 min. It was assumed that the study dropout rate would be 10%, and, therefore, a sample of 100 patients (50 in each study group) was recruited. Recorded data were analyzed using the statistical package for social sciences, version 20 (SPSS Inc., Chicago, Illinois, USA). Normality of quantitative data distribution was tested using the Shapiro–Wilk test. Data were presented as mean (SD), number, or median (interquartile range) as appropriate. The two groups were compared using the independent sample t-test, the Mann-Whitney U-test, and the χ2-test (with Yates correction if needed) as appropriate. A P-value of less than 0.05 was considered statistically significant. All enrolled patients (50 in each group) completed the study. There were no significant differences between the two groups regarding the patients’ characteristics ([Table 1]). The baseline platelet count, INR, activated partial thromboplastin time, and bleeding time were comparable in the two groups ([Table 2]). The HR and MAP showed no significant differences between the two groups at baseline, 30, 60, and 90 min. 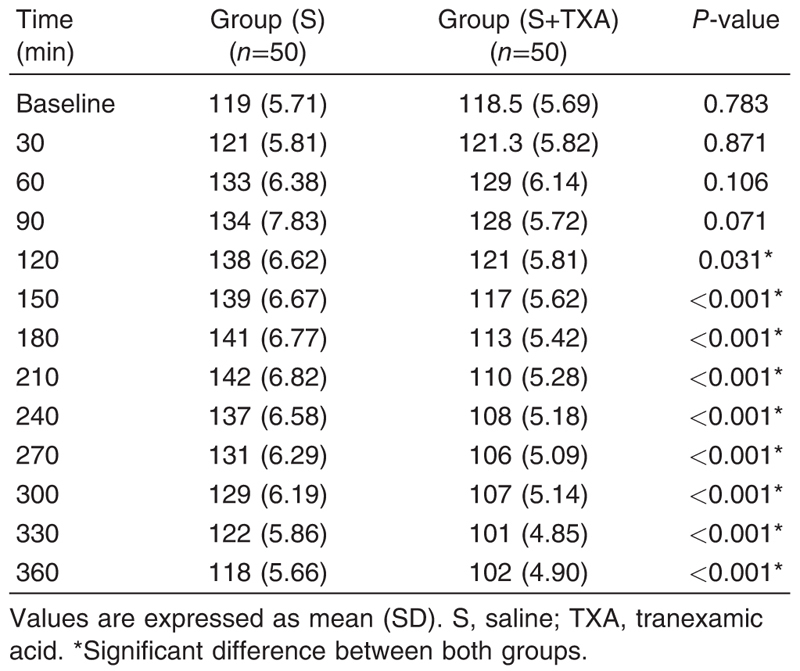 The HR was significantly lower and the MAP was significantly higher in group TXA-S compared with group S throughout the rest of the study period, from 120 to 360 min ([Table 3] and [Table 4]). There was no incidence of oxygen desaturation in the two groups. Patients’ baseline, 1, and 6 h values of hemoglobin concentration and Hct% were comparable in the two groups. However, the values of these two variables were significantly less in group S from at second hour till the fifth hour of the study, revealing less bleeding in group TXA+S ([Table 5] and [Table 6]). 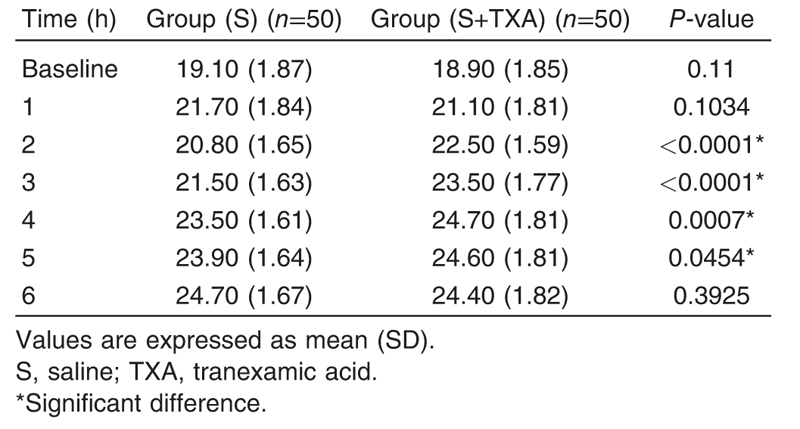 Transfusion of packed RBC units were significantly less in group TXA-S compared with group S ([Table 7]). Time needed to reach a Hct value less than 1% in the effluent wash was shorter in group TXA-S compared with group S ([Table 8]). 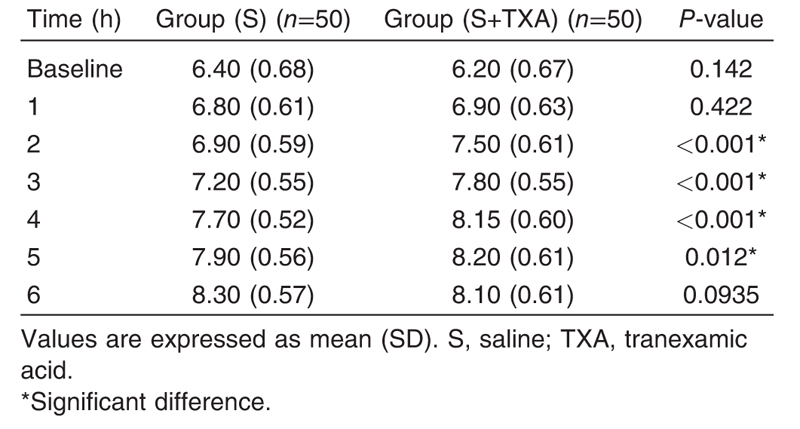 The volume and number of lavages were statistically less in group TXA-S than in group S ([Table 8]). Time taken to perform UGI endoscopy was significantly shorter in group TXA-S [667 (198) min] compared with group S group (1094 (163) min] (P<0.001). No complications related to TXA or gastric lavage were recorded in the two groups. The current study showed that addition of TXA to nasogastric lavage in patients with hematemesis significantly improved hemodynamic stability, decreased time of bleeding, transfusion requirements, and time taken to perform upper endoscopy. Gastrointestinal bleeding is a serious and common complication in patients with liver cirrhosis, representing a leading cause of death. Mortality remains as high as 15–20% despite the diagnostic and therapeutic developments in the management of the acute episode . The liver plays a central role in the hemostatic system as it synthesizes the majority of coagulation factors and proteins involved in fibrinolysis; moreover, it produces thrombopoeitin, which is responsible for platelet production from megakaryocytes . Furthermore, there is a continuous low-grade activation of endothelial cells and continuous release of several hemostatic proteins whose levels are frequently elevated in patients with liver disease (e.g. von Willebrand factor) . Portal hypertension, a common complication of chronic liver failure, results in hemodynamic changes that may impact the endothelial function  and splenomegaly, which causes increased platelet sequestration in the spleen . TXA is a drug that helps in blood clotting. It is a 4-aminomethyl cyclohexane-carbolic acid, which is a synthetic derivative of the amino acid lysine. TXA prevents plasmin-mediated conversion of fibrinogen to fibrinogen split products by competitively binding to the lysine-binding sites on the plasminogen and plasmin on platelets and exerting a protective effect on platelets . Reliable evidence that TXA reduces blood transfusion in surgical patients has been available for many years . An effective way to administer this drug is to mix it with sterile water and apply it directly to the bleeding surface (topical application). There are many clinical trials in which topical administration of TXA have been used successfully, trials including epistaxis , cardiac surgery , liver surgery , gynecology , and knee surgery . TXA has the potential to inhibit local fibrinolysis at the site of bleeding with minimal systemic absorption, thus decreasing the morbidity and mortality associated with severe bleeding. Using it as a topical drug in hematemesis by giving it through the nasogastric tube to decrease bleeding in cirrhotic patients would be of substantial clinical importance, as there were no clinical trials done to assess its effect in nonsurgical causes except in the epistaxis. Our study revealed a statistical and clinical difference between the two study groups as there was more hemodynamic stability regarding MAP and HR in group TXA+S compared with group S. Hemoglobin concentration and Hct values were significantly less in S group, reflecting less bleeding in group TXA+S leading to a significant decrease in blood transfusion requirements in the patients of group TXA+S. The volume and number of washes were significantly less in group TXA+S. We used the time needed to reach Hct value less than 1% in the washed fluid as an objective endpoint to stop the wash and prepare the patient for an early endoscopy. This was in agreement with the results recorded by the Cochrane collaboration in 2013, conducted by Ker et al. to assess the efficacy of topical application in many surgeries, revealing reliable evidence that TXA decreases blood loss in surgical patients by about one-third. In addition, TXA reduces the risk of receiving blood transfusion in surgical patients. The Cochrane database stated that, although only one trial has been conducted in a nonsurgical setting, the similar hemostatic response and observed beneficial effect in surgery raise the possibility that TXA might also be effective in other bleeding conditions such as hematemesis. In our study, the time taken to perform UGI endoscopy was significantly shorter in group TXA+S, which is considered a major benefit for the patients. Currently, guidelines support the use of upper endoscopy within 24 h for patients presenting with UGI bleeding . The advantages of undergoing earlier endoscopy include achieving hemostasis more quickly, possibly preventing complications, decreasing transfusions, and length of hospital stay for these patients ,,. It is considered helpful to irrigate the stomach before endoscopy to remove residual blood and other gastric contents as it can be obscured with blood, potentially making it difficult to establish a clear diagnosis and perform therapeutic maneuvers, in which case a second endoscopy may be required to establish a diagnosis and to potentially apply therapy . Our study also revealed no incidence of complications from using local TXA (stroke, myocardial infarction, deep vein thrombosis, pulmonary embolism) or death, which was in agreement with the findings of many previously published studies ,. Moreover, there was no incidence of complications from performing gastric lavage in the two groups, which was in line with the findings of other studies, reporting that large volume gastric lavage before endoscopy for acute UGI bleeding is safe and provides better visualization of the gastric fundus . Therefore, it can be concluded that topical application of TXA in nasogastric tube wash can be used effectively and safely to decrease bleeding, transfusion requirements, and time taken to perform emergency endoscopy in cirrhotic patients having an attack of hematemesis. Biecker E. Gastrointestinal bleeding in cirrhotic patients with portal hypertension. ISRN Hepatology 2013;541836:20. Mannucci PM, Tripodi A. Liver disease, coagulopathies and transfusion therapy. Blood Transfus 2013;11:32–36. Ferro D, Celestini A, Violi F. Hyperfibrinolysis in liver disease. Clin Liver Dis 2009;13:21–31. Gluud LL, Klingenberg SL, Langholz E. Tranexamic acid for upper gastrointestinal bleeding. Cochrane Database Syst Rev 2012;1:CD006640. Dunn CJ, Goa KL. Tranexamic acid: a review of its use in surgery and other indications. Drugs 1999;57:1005–1032. Mongan PD, Brown RS, Thwaites BK. Tranexamic acid and aprotinin reduce postoperative bleeding and transfusions during primary coronary revascularization. Anesth Analg 1998;87:258–265. Wellington K, Wagstaff AJ. Tranexamic acid: a review of its use in the management of menorrhagia. Drugs 2003;63:1417–1433. Maniar RN, Kumar G, Singhi T, Nayak RM, Maniar PR. Most effective regimen of tranexamic acid in knee arthroplasty: a prospective randomized controlled study in 240 patients. Clin Orthop Relat Res 2012;470:2605–2612. Lee SD, Kearney DJ. A randomized controlled trial of gastric lavage prior to endoscopy for acute upper gastrointestinal bleeding. J Clin Gastroenterol 2004;38:861–865. Cheng DW, Lu YW, Teller T, Sekhon HK, Wu BU. A modified Glasgow Blatchford Score improves risk stratification in upper gastrointestinal bleed: a prospective comparison of scoring systems. Aliment Pharmacol Ther 2012;36:782–789. Stainsby D, MacLennan S, Thomas D, Isaac J, Hamilton PJ. British Committee for Standards in Haematology Guidelines on the management of massive blood loss. Br J Haematol 2006;135:634–641. Augustin S, Muntaner L, Altamirano JT, González A, Saperas E, Dot J et al. Predicting early mortality after acute variceal hemorrhage based on classification and regression tree analysis. Clin Gastroenterol Hepatol 2009;7:1347–1354. Lisman T, Leebeek FWG, de Groot PG. Haemostatic abnormalities in patients with liver disease. J Hepatol 2002;37:280–287. Lisman T, Bongers TN, Adelmeijer J, Janssen HL, de Maat MP, de Groot PG, Leebeek FW. Elevated levels of von Willebrand factor in cirrhosis support platelet adhesion despite reduced functional capacity. Hepatology 2006;44:53–61. Cahill PA, Redmond EM, Sitzmann JV. Endothelial dysfunction in cirrhosis and portal hypertension. Pharmacol Ther 2001;89:273–293. Aster RH. Pooling of platelets in the spleen: role in the pathogenesis of ‘hypersplenic’ thrombocytopenia. J Clin Invest 1966;45:645–657. Makwana J, Paranjape S, Goswami J. Antifibrinolytics in liver surgery. Indian J Anaesth 2010;54:489–495. Zahed R, Moharamzadeh P, Alizadeharasi S, Ghasemi A, Saeedi M. A new and rapid method for epistaxis treatment using injectable form of tranexamic acid topically: a randomized controlled trial. Am J Emerg Med 2013;31:1389–1392. Barkun A, Bardou M, Marshall JK. Consensus recommendations for managing patients with nonvariceal upper gastrointestinal bleeding. Ann Intern Med 2003;139:843–857. Spiegel BM, Vakil NB, Ofman JJ. Endoscopy for acute nonvariceal upper gastrointestinal tract hemorrhage: is sooner better? A systematic review. Arch Intern Med 2001;161:1393–1404. Cooper GS, Chak A, Way LE, Hammar PJ, Harper DL, Rosenthal GE. Early endoscopy in upper gastrointestinal hemorrhage: associations with recurrent bleeding, surgery, and length of hospital stay. Gastrointest Endosc 1999;49:145–152. Yang ZG, Chen WP, Wu LD. Effectiveness and safety of tranexamic acid in reducing blood loss in total knee arthroplasty: a meta-analysis. J Bone Joint Surg Am 2012;94:1153–1159. Chimento GF, Huff T, Ochsner JL Jr, Meyer M, Brandner L, Babin S. An evaluation of the use of topical tranexamic acid in total knee arthroplasty. J Arthroplasty 2013;28 (Suppl):74–77.